Amidst the Otemachi district, the political and financial hub of Tokyo, Hoshinoya is a food lover’s hideout. 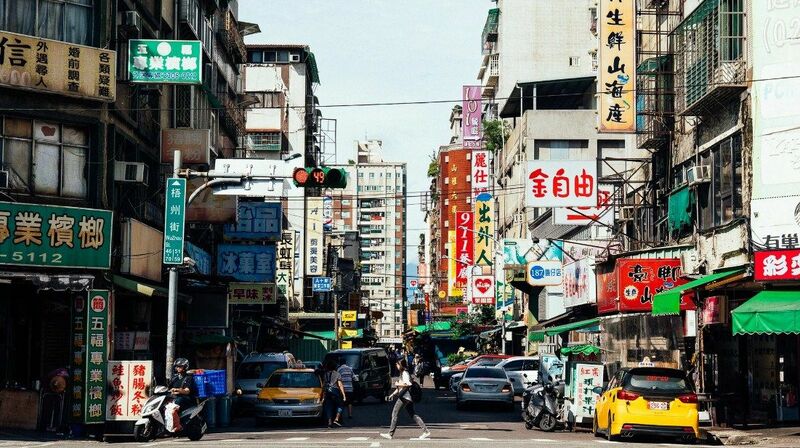 Even in one of the most ADD-inducing metropolises in the world, whirring with options to eat, see and do, you’ll be happy to miss out on what’s just outside as you become enveloped in the Hoshinoya womb. There is no grand entrance visible from the outside as you find your way into this 84-room hotel. But then again, it's no ordinary hotel. It's a ryokan, a traditional Japanese inn that originated in the eighth century A.D.—with Nishiyama Onsen Keiunkan, the oldest in the world, dating back to 705 A.D. They're far more common in scenic rural areas than bustling metropolises like Tokyo, which makes Hoshinoya that much more notable. You’re escorted in via an unassuming valet parking entrance and up the elevator. But when the doors slide open, you gasp at the high-ceilinged, long tatami-covered foyer, fragrant with bamboo fiber. At the end is a shrine to the seasons, quietly showcasing changing flower arrangements—today, early bloom cherry blossoms. 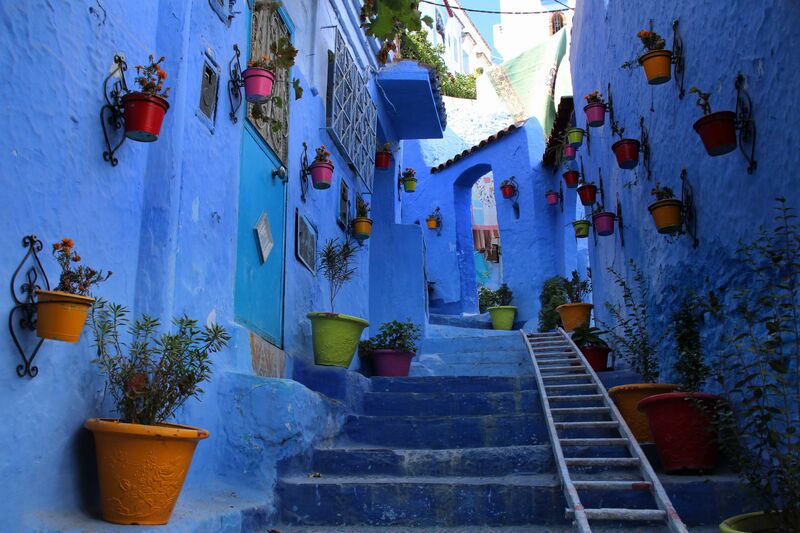 Your shoes are swiftly whisked away along with whatever was on your mind from the outside world. You spend the morning or afternoon learning about tea, sake, incense, kimono wrapping and Japanese etiquette. And come evening, you relish in feature performances like a grand kagura, traditional Japanese acrobatics, or garaku, a theater art that mixes dance with music. The tea lounge will inevitably draw you in. 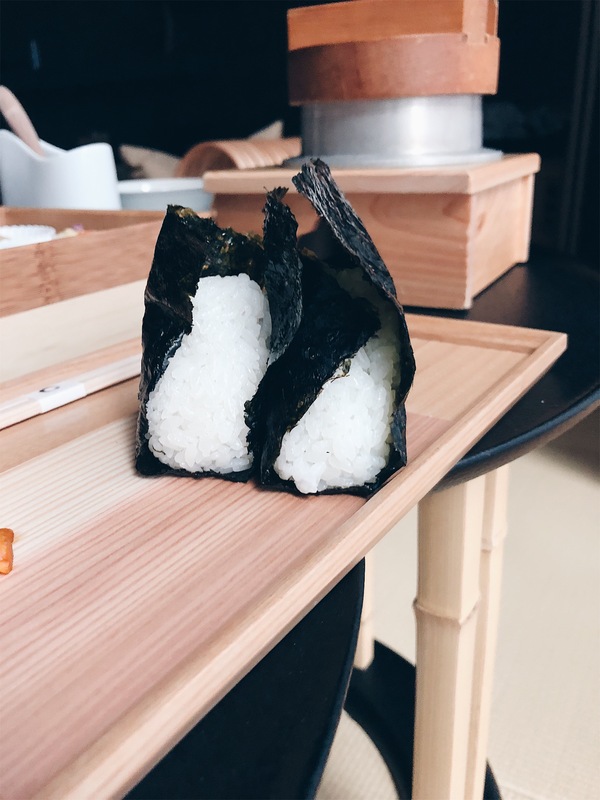 With one on every floor, they’re stocked with the most delicate, beloved Japanese snacks that’ll make you feel so at home—if home were your elegant Japanese grandmother’s house, that is. The descriptions teach you about, say, kuzuyu, a dessert soup make from arrowroot. You gather up a stash for your room from the selection of fresh and dried fruit, artisanal crackers and instant soup noodles made from better-for-you ingredients than standard cup ramen. 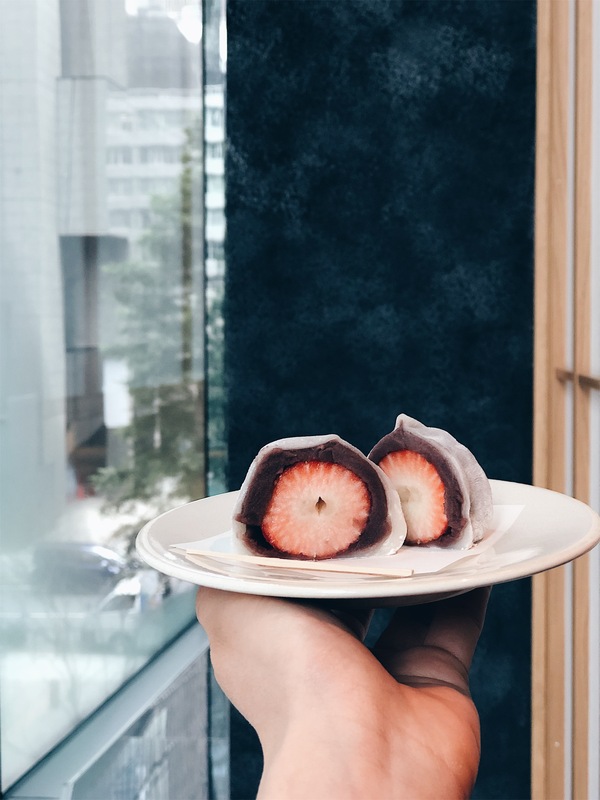 The highlight is the daifuku you savor on the spot—fresh mochi (rice cake) which reveals a plump strawberry inside when you bite into it. The on-property fine dining restaurant features Nippon cuisine (using French techniques complemented by Japanese ingredients) by executive chef Noriyuki Hamada, a bronze Bocuse d’Or winner. However, you’re almost glad to stay in-room for the intricate, round-the-clock dining options—definitely not your standard room service. The all-important Japanese breakfast spread features an onigiri (rice ball) assortment with grilled fish, egg, greens, rice and pickles. Chef Hamada uses only ingredients from Japan’s mountains and seas, the way his mother would use only the best ingredients to make comfort foods for him. It’s no wonder then that the curry with rice here is such a humble showstopper. Curry is a classic dish enjoyed both in restaurants and at home by Japanese of all ages. The Hoshinoya rendition is the epitome of this dish, you feel sure of it. Balanced with an underlying heat, it takes almost two days to make. It’s extra soup-y, not chunky, yet you can nearly taste every individual ingredient going into it—a smooth, harmonic yet multidimensional roux of onions, carrots, celery, tomatoes, ginger, coconut milk and Japanese beef tendon and round. The rice is perfectly cooked. You ponder ordering another portion to your room. Unlike other curry-makers, he adds a nontraditional touch to his curry: Japanese sansho pepper powder, which has a distinctively bright, citrusy and nearly effervescent flavor. It elevates the dish and makes it even more addictive. Chef Hamada’s meticulousness extends to his foraging and sourcing; he incorporates “ugly” fish, innards and scraps—what others might consider waste—into his dishes, as much for deliciousness as for the environmental benefits. 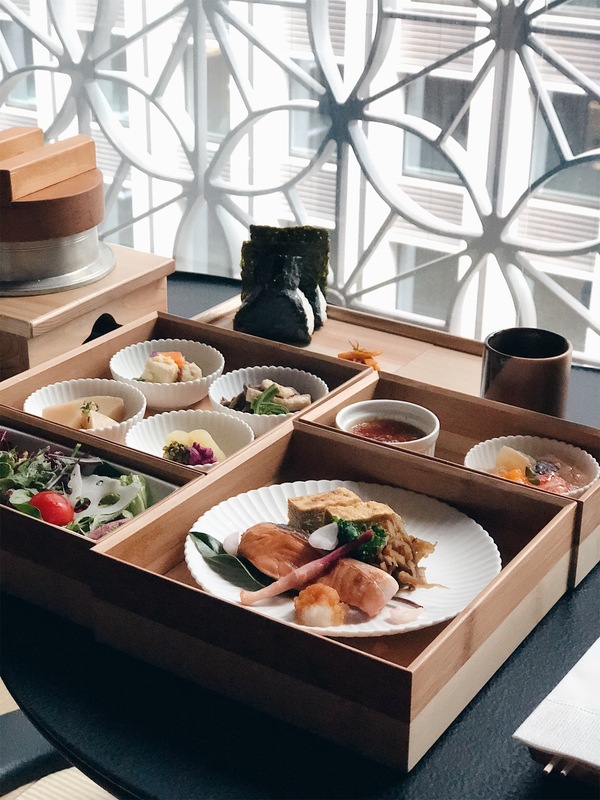 Hoteliers differentiating their properties by way of food (both in-room and in public) may feel new; however, food-focused accommodations began long ago here in Japan—with the history of ryokans steeped in culinary excellence. Ryokans originated as hatagos, or simple houses welcoming travelers and serving them sustenance. During the Edo period, traveling became popular among Japanese citizens, which explains why most hatagos were located near the highway. Competition among hatagos became stronger due to the increasing number of travelers, including travel among the bushi (samurai class) as well. In order to compete with others, the hatagos elevated the food they were serving. 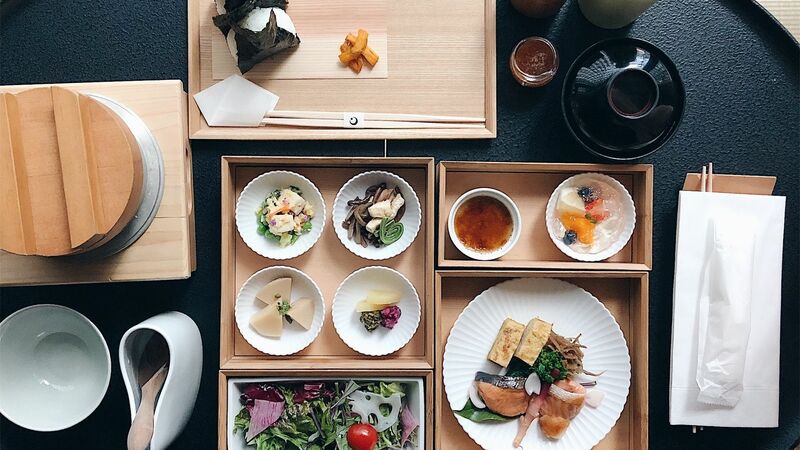 That is why, even today, the ryokan's standard room rate includes two meals, usually breakfast and one other meal, often intricately served in-room. 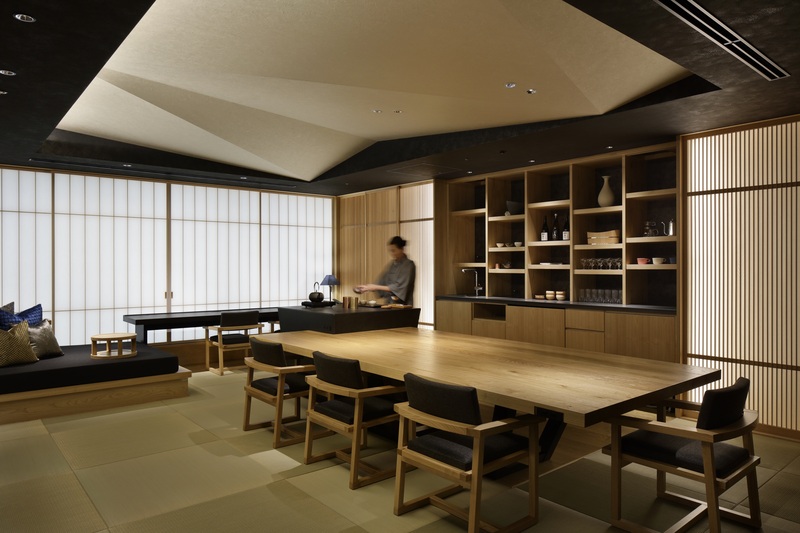 Gastronomy aside, the design of ryokans like Hoshinoya is enough to charm. Designer Rie Azuma combined traditional and modern elements, incorporating stark lines juxtaposed against natural materials of wood and stone. The entryway to the restaurant is lit like a museum filled with ancient artifacts; on display are cups formed with an Edo period glass cutting technique. 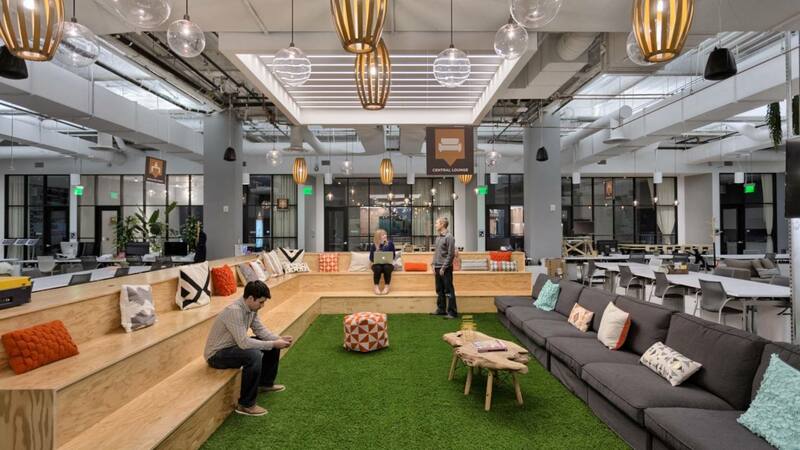 Indeed, this is a space meant to be relished slowly from the inside. The building’s exterior is architecturally discreet for onlookers peering in. However, looking outward, the windows are covered in a privacy grail that emulates traditional kimono motifs, sparkling with moving patterns of sunlight. 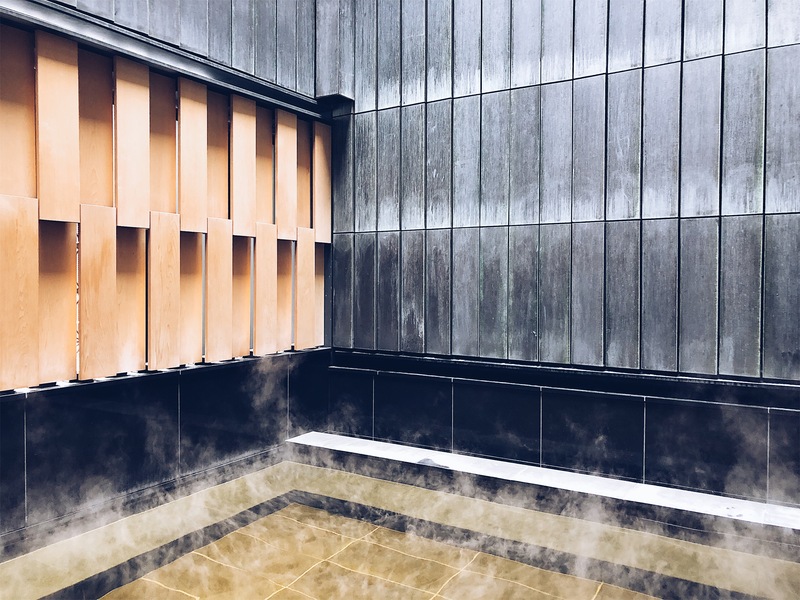 Consideration of design and care in the onsen (Japanese hot spring) is no exception. While many spas in the city bring water from other areas of Japan, here, the spring water is actually pumped up from this exact site, 1,500 meters below ground—deeper than Tokyo subway. The water is a chartreuse color from the naturally-occurring sea salts, sulphur and other minerals. 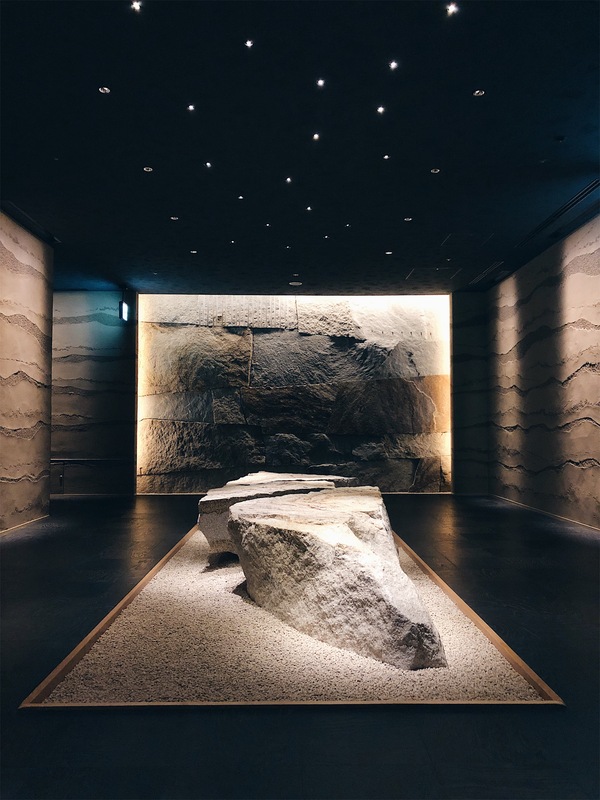 While in this onsen, don’t forget to look up to the sky, a shifting open-air “ceiling” via a tall open air shaft for yet another purposeful Azuma view—again, best taken in from the inside outward. The exclusivity is reflected in rules. Privacy is taken very seriously here, to the point that guests are not permitted to bring non-guest to the room floors. Friends and visitors from outside must remain in the public areas of the property. You try mightily to order the in-room curry to devour one last time in the lobby, but it’s not allowed. While you’re surprised by these restrictions, you eventually come to respect this utterly Japanese intentionality—it somehow made the stay (and the curry) feel more intimate and, sigh, fleeting. You decide you must go back. Want It To Experience The Ryokan Charm At Hoshinoya For Yourself? Journy Can Help. For travelers headed to Tokyo in 2019, available beginning April 1 at Hoshinoya Tokyo, we can book you in their “Edo Beauty Stay,” offering guests the opportunity to learn about Japanese culture, featuring workshops about tea ceremonies, the art of shamisen (a traditional guitar-like instrument), origami and seasonal decoration. Included in the experience is a rice-based body treatment ideal for rejuvenating skin cells, followed by camellia oil treatment for hair. You’ll also enjoy an Edo period-themed healthy breakfast. 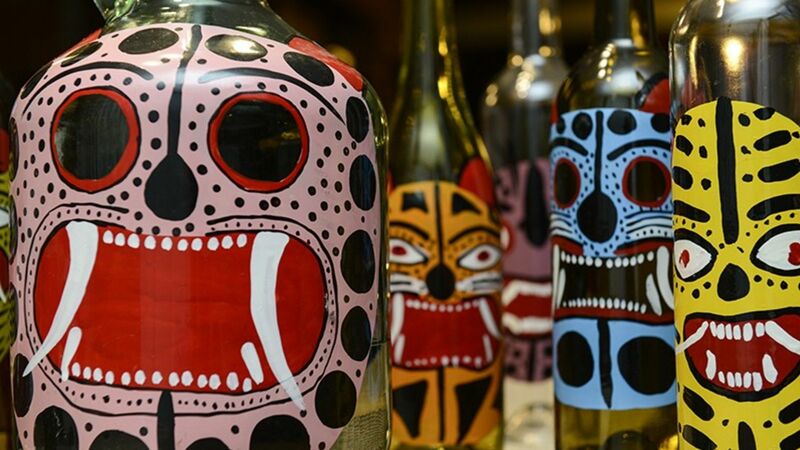 Priced at 98,000 JPY or approx. USD $868 per person (room rates are separate).